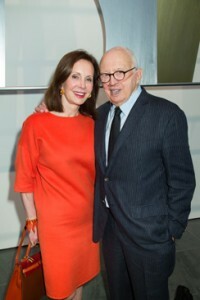 Marie-Josee Kravis with Ellsworth Kelly at a MoMA luncheon held in his honor. Ellsworth Kelly is turning ninety years old. As an artist, that means he’s had plenty of time to create a sizeable collection of work. Painting, sculpture, drawing, posters—none of it falls outside his realm. He’s literally done it all. And no one’s a bigger fan of Mr. Ellsworth’s work than the MoMA, and especially its president, Marie-Josee Kravis. At last months’ garden party in New York City, the economist and art lover joked that she and her husband, Henry Kravis of KKR, might as well live with Mr. Kelly and Ms. Sherman—they’ve got that much of his art hanging in their house. Even Marie-Josee Kravis’ dress was “Ellsworth Kelly inspired,” with bold black, white, red, and baby blue stripes covering a classy knee-length dress. In celebration of Mr. Kelly’s ninetieth, MoMA is putting on a new exhibit for the artist. Throughout the years, the museum has collected a total of 15 paintings, 5 sculptures, 38 drawings, 137 prints, and one poster from the artist. This new exhibit, “Ellsworth Kelly: Chatham Series” will display the complete first set of paintings Kelly completed after leaving the Big Apple for Spencertown. The exhibit will be displayed in the Alfred H. Barr Jr. Painting and Sculpture Galleries, fourth floor, until September 8th. The collection is widely considered one of his greatest achievements as an artist. The paintings were completed in his then new studio in Chatham, located in the historical “Cady’s Hall,” providing ideal space, lighting, and isolation for Kelly to find and keep motivation. “Reuniting this landmark series for the first time provides a welcome opportunity to revisit a key moment in Kelly’s artistic development,” reads the MoMA press release.